I have a confession to make. I am 27 years old, and I love river cruising. Now admittedly, I was a cruise virgin -- and I mean all cruises, not just river cruising -- until recently. I can't say for certain that I would never enjoy a larger oceanic cruise, but after my Viking experience, I don't know how I'll ever turn back. And here's why. First, let me debunk the myth that river cruising is only for old people, to put it bluntly. Yes, the average age of the passengers walks the line between 60s and 70s, but don't let that fool you. They were the ones polkaing into the wee hours of the night and throwing back rounds of German beers as if they were locals. I shamefully was the first to waive the white flag one evening when I couldn't keep up with the multiple rounds of schnapps. I also was not the youngest passenger on the ship. There were young newlyweds, couples in their 30s and 40s and a family with teenagers. One of my favorite aspects of the Viking experience is that it is an intimate one, so you are forced to mingle with the other guests, especially during meals. In doing so, I learned a few valuable lessons: You don't shrivel up and die once you reach the age qualifying for social security. In fact, that's when you can really start living, according to a group of traveling girlfriends in their 70s whose wanderlust has led them to nearly every continent in the last few years. I also met several couples celebrating anniversaries of 50-plus years. They regaled me with tales of their romances and gave me hope that, even in the age of Tinder, true love still exists. Since I was traveling during winter, upgrading to a room with a balcony or veranda didn't really appeal to me, so I happily saved a few pennies by booking a water-level room. That's just a fancy way of saying that if I were traveling on the Titanic, I'd be with Jack in third class. Although the square footage shrank, the quality, to my surprise, did not. Living in Manhattan for five years prepped me for tight quarters, but there was plenty of storage space so that I didn't feel too claustrophobic. Our bathroom, albeit tiny, was nicer than some at 4-star hotels, and the heated floors were just the ticket after a day spent in 30-degree weather. Viking sets the bar for service not just in the cruise industry but in the entire travel industry. I may have booked the cheapest fare, but I was treated like first class from the moment I set foot on the ship, when I was greeted with steamed hand towels and the most decadent peppermint hot chocolate. By day two, Istvan, a member of the Viking crew, knew that I drank two apple juices in the morning; that my mom and I would split a single pancake; that we each took two sugars in our coffee; and that I always indulged in a cookie and hot chocolate before the daily briefing. If my mom and I ever ordered differently during dinner service, I would routinely eat off her plate, but Istvan caught on quickly and began bringing me tastings of each item. Perhaps that makes us creatures of habit (and me a glutton), but that kind of attention to detail made the trip that much more memorable. The best part of cruising is that you go to bed in one city and wake up in a new one without feeling like any time has been wasted. While the capital cities like Vienna and Budapest are must-sees, it's the small riverside towns that charm. You can walk around Passau, home of gingerbread, in a matter of two hours, and with so little street traffic, there's a serenity that pours over this city. Winter also brings the sounds of Christmas carols when entering the main town center, location of St. Stephen's Cathedral and the Passau Christkindlmarkt. Regensburg, my favorite of the cities we visited, looks as if it were straight out of a storybook. Christmas lights flank the streets. The colorful building facades have been restored to their original state. And similar to Passau, there are so few cars that the cobblestone streets act more like pedestrian walking paths. It's also home to the oldest sausage kitchen, but even that has been so beautifully restored that it looks as if it just opened its doors. This was a Christmas Market cruise, so of course the markets were the highlight of the vacation. Each town hosted at least one market and they were all unique in their own right. However, some similarities emerged: We could always be sure to find a good cup of glühwein, and we had to put on our bratwurst judging hats since each city claims they make the best. Travelzoo Tip: If you choose to forego the three euro deposit, the glühwein cups are keepsake souvenirs and each feature drawings of the market. There are several contenders for Germany's most famous market, but Nuremberg usually takes the lead. Instead of mass-produced goods, you'll find locally sourced food and crafts, including the famous prune men (small dolls created out of dried fruits). Be sure to sample the Nuremberg sausage, which is unlike any of the others. Passau and Regensburg are smaller cities, so their markets are a fraction of the size of Nuremberg's; however, they still have plenty to offer. Passau is known for glasswork, so hand-blown ornaments are abundant. 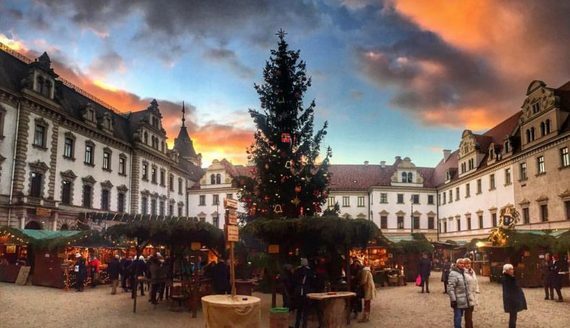 Regensburg hosts a Christmas Market within the palace walls of Thurn and Taxis. Its name translates into "Romantic Christmas Market" and romantic it is indeed. Picture fire pits, caroling, lightshows and a palace that looks like it should be in a Disney movie. To round out the list, Vienna offers several markets, but the two that stand out are the Christmas market at Schönbrunn Palace and the Wiener Rathausplatz market in front of City Hall. You'll find the traditional craft and food stalls featured in every city; however, the luminous backdrops of the Viennese markets are by far the most captivating, so plan for equal parts shopping and picture taking (recommended after sunset for the full effect). Amanda Mulligan is a deal expert at Travelzoo and based in New York. Travelzoo has 250 deal experts from around the world who rigorously research, evaluate and test thousands of deals to find those with true value.